Remember the 3D sketch and the in-progress picture of the indoor therapy pool at the Woodinville project? (Click here to jump to the original post.) Here is a photo of the pool, finished and ready for fun! We designed a curved aluminum plate suspended by rods to support the Surehands track that carries the clients' daughter in a sling from her bed, to the bathroom, and into the pool. The plate was powder-coated white to match the Surehands track and kept minimal in scale to maintain the open feeling of the room. Our project foreman took a preview ride to torture-test it and gave it two thumbs-up for sturdiness. This bathroom was designed to be utilized by the daughter and her caretakers as well as those enjoying the adjacent pool. The bathroom is adjacent to the pool room, and the entire floor is designed to be both slip-resistant and to drain when wet. The changing table, sink, and tub are all height-adjustable. Storage was carefully planned to be within the caretaker's reach at each station. Here, you can see the overhead tracks above the toilet and the changing table - which continues through the door and over to the pool as seen in the first photo. The bathroom features an adjustable-height tub and open shower area washed in natural light. Our design philosophy throughout the house was that everyone should be able to go everywhere in the house, which means that the master bathroom is sized for wheelchair maneuverability even though the primary users of this room do not use wheelchairs. The curbless shower and digital thermostatic controls in the master bathroom are added safety features. 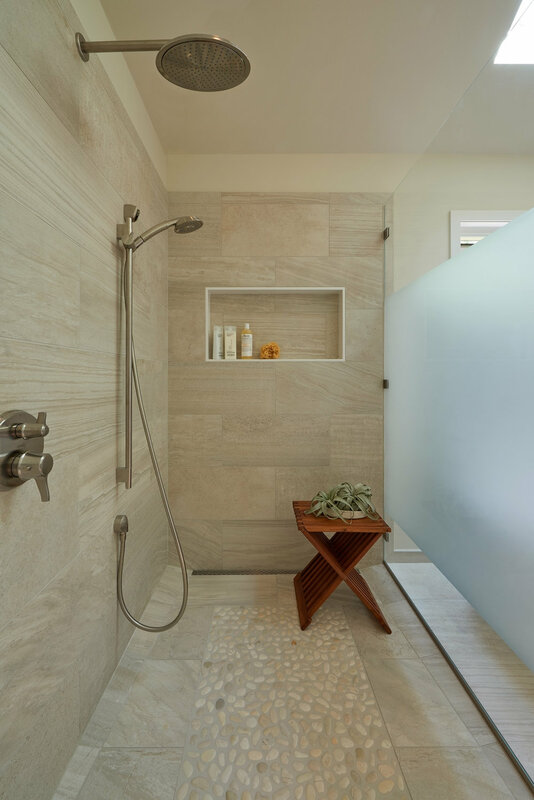 The theme of bright, airy spaces is continued throughout the house, including the master shower where the glass was partially etched for privacy while maintaining clear glass at the top and bottom for openness. Line of sight from the kitchen to the playroom allows the family to be together while involved in separate activities. Knee-space and maneuverability for wheelchair-users was incorporated into the design. The naturally-lit playroom interiors, designed Lucy Johnson Interior Design, received a National Kitchen and Bath Association Design Award for design excellence. With two basins, you have to choose which side to put the garbage disposal on. Most people choose the smaller side, envisioning themselves peeling carrots blissfully right into the garbage disposal. But, what about when you have to soak the burnt stuff off the bottom of a big pot? You'll end up dumping the water in the deep side (because the other basin is too small to empty out the contents of your large pot as fast it will pour out). Then, you'll end up scooping out the gunk with your fingers to move it from the larger basin's drain to the disposal - YUCK. The divider between the two basins makes it difficult to hand wash large trays. Even if the center divider is designed to be lower to help with this issue, there is a lot of maneuvering around required to wash & rinse baking pans - which inevitably causes you to spill water onto the counter and your waist. And, isn't it better when the whole baking tray can fit in the sink so that you can still use the sink to wash your hands, if needed... rather than balancing the tray on the center divider while it soaks? Almost no one washes dishes at home like they used to before dishwashers were common. Two basins used to make sense because you would fill up one side with soapy water to wash and the other side with clean water to rinse before stacking the wet dishes in a dish drying rack on the counter (or handing them off to a helper, if you were lucky enough to have one). During meal prep, your kitchen sink is usually doing 3 jobs: washing hands, rinsing produce, and holding on to dirty dishes that there is no room for in the dishwasher (the last job being our own fault for getting in our own way of a pleasant cooking experience). After your meal, the sink is used to soak dishes that need extra attention before they go into the dishwasher, or for washing hand washables. Both are great options, and I have not had any clients who regretted either choice. I tend to suggest one over the other more for appearance and price point rather than maintenance concerns. Our favorite fireclay sink is the Shaws Original Lancaster Single Bowl Apron Front RC3018. The 30"x18"x10" size (26-3/4"x15-1/4"x8-1/2" inside) is perfect for baking trays. The blue 'Shaws' badge on the back of the sink dates back to its origins in 1897, making it perfect for vintage-vibe kitchens. An offset drain leaves room for a pull-out below the sink for garbage and recycling bins. The cabinet needs to be designed to hold a 190 lb. sink and water. This is typically done with a 3/4" plywood deck support. The sink can be mounted a number of ways, most commonly it is undermounted below the countertop surface. It can also be mounted so that it is above the countertop, creating a vertical lip. The cabinet face will have to be scribed to the sink shape. Your cabinetmaker/installer will need the actual sink in order to do this. YOU NEED A VERY SKILLED INSTALLER TO DO THIS WELL SO THAT THE JOINT IS AS CLEAN AS POSSIBLE. If you have conversion varnish finish on your cabinets (which is most common these days), any touch-up will need to be done by a skilled professional. You will need to order a sink flange extension for the garbage disposal, due to the thickness of the sink. The positioning of the sink from front to back needs to be planned to accommodate the installation of faucets & accessories. If you are undermounting the sink, the amount that the countertop laps onto the top rim of the sink will need to be specified so that you get the result you intended. You will need to specify a right or the left side drain, otherwise you will get a random choice (they manufacture more left-side drains than right-side drains, so you are more likely to get a lefty). To avoid water spotting, the manufacturer suggests that you wipe down the sink bottom after use. Waxing the sink will encourage drainage. If a metal pot or pan leaves a mark on the surface, ROHL recommends Astonish Cleaner available from your local ROHL dealer to remove it. Fireclay is resistant to chips, scratches, and stains. However, if you do get a chip, you many purchase a color-matched repair kit from your local ROHL dealer. ROHL offers a 10-year warranty on fading/staining. Our favorite cast iron sink is the Kohler Whitehaven Self-Trimming under-mount single-bowl kitchen sink with short apron K-5826. This one is less expensive (approx. $950 retail) than the Shaws sink approx. $1,400 retail) and tends to be easier to source from local plumbing retailers with faster turnaround. It also has an offset drain. This one is always in the rear right-hand corner, so you will have room for a pull-out below the sink for garbage and recycling bins. A left hand drain option is not available. There is a notch in the sink behind the apron that allows the cabinet face to slide behind it. So, you don't have to cut the cabinet face in the exact shape of the sink, and you will get a clean cosmetic result with less risk during installation. You do not need a sink flange extension for the garbage disposal (the sink body is not as thick as the Shaws sink body). Due to the notch behind the apron, the position of the sink from front-to-back on the countertop is fixed for this sink. It is also larger in the front-to-back dimension than the Shaws sink, so you will need to make your sink base cabinet deeper if you need more room for faucets behind the sink. There are two apron heights available. The inside of the sink is the same size for both. We prefer this version, the shorter apron, because it looks nice with the typical height of top drawers and allows for larger doors under the sink (which means the garbage/recycling bins can fit). The inside dimensions of the bowl are slightly larger at 27-3/4"x18-1/16"x9". Overall dimensions are 32-1/2" (apron front) x21-9/16"x9-5/8" (deepest part of the bowl). This is also a heavy sink that requires support, such as a 3/4" deck. You should not use abrasive cleaners to clean the porcelain enamel finish. If the porcelain enamel chips through to the iron, the dark cast iron color will show and exposed iron can rust. However, Kohler provides a warranty against chips, cracks, or burns for as long as the original purchaser owns his/her home. Gloss reduction, scratching, staining, and alkaline etching of the finish over time due to use, cleaning products, water, or atmospheric conditions are considered normal wear & tear and not covered under warranty.